The 2019 Renault Captur receives a crucial equipment upgrade, with numerous safety features now available as standard across the range. 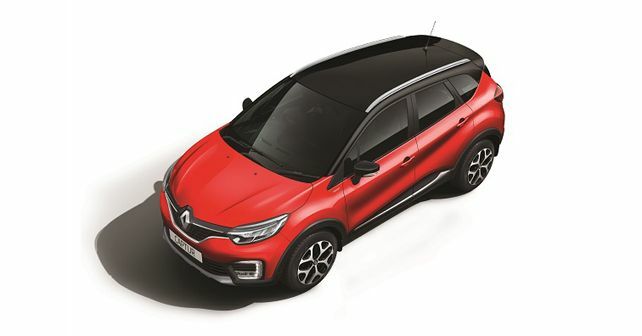 Renault has updated the Captur for 2019, and as part of the upgrade, the car is now available in just the base RXE and top-spec Platine Dual Tone variants, meaning an exit for the previously available RXL and RXT variants. Further, both trim options are available with either a petrol or diesel engine option. The prices for the 2019 Captur now start at ₹ 9.5 lakh and go up to ₹ 12.99 lakh for the top Platine Dual Tone diesel variant (all prices are ex-showroom, Delhi). The starting price of the 2019 Captur is about ₹ 50,000 less than that of the previous base version. Earlier, the Platine variant was only available with a diesel engine option. While the car gets added safety and equipment kit, it remains unchanged mechanically. Inside, the Captur gets Renault's new 17.64cm MediaNAV Evolution touchscreen infotainment system, which comes with Apple CarPlay and Android Auto connectivity. The infotainment system also gets the 'Eco Guide' function, which provides information on the driving pattern and tips for efficient driving, and Voice Recognition. The Platine versions of the Captur now get new premium Black and Ivory interiors with black leatherette seats. As mentioned above, the 2019 Captur carries over the exact same powertrains – a 1.5-litre H4K petrol motor mated to a 5-speed manual gearbox, which pumps out 105bhp and 142Nm of torque, and a 1.5-litre K9K diesel motor, which comes mated to a 6-speed manual gearbox. The diesel motor churns out 108bhp and 240Nm of torque. Its a pity such a good car where manufacturer got confused. It is a cross over with 2 basic problems, narrow seats and lack of automatic transmission. If you are an urban user, automatic is a must as they churn around 50% of sales. If you need a highway cruiser then seats should be comfortable to accommodate long journeys and this vehicle provides none. To top it off in a developing economy you are providing while interiors. Renault has tasted success with Duster and they could have given the same treatment to this one but unfortunately missed the opportunity. Time to revisit strategies and understand the market all over again.